Detail, “Dr. Charles Anthon,” LoC, Mathew B. Brady photographer. Martin Harris’s visit with Charles Anthon is iconic, almost on par with Mormon foundational events such as the First Vision or the angel’s visitation on the eve of the 1823 autumnal equinox. Anthon played an unwitting actor along with Harris in a divine drama, one foreseen by Isaiah, especially as depicted in the longer versions of Isaiah found in the BoMor and JSR; though by the time Joseph Smith dictated those versions they were effectively vaticinium ex eventu. Their meeting wasn’t happenstance. God’s appearance to Harris precipitated his journey with the sheet of esoteric characters. Anthon—who at the time the farmer visited was assistant professor of Latin and Greek at Columbia College, New York—was a recluse of sorts: he rarely attended social events not sponsored by the university; his rules were inviolable and he was a swift disciplinarian; his paramour lay within his books, he never married; known to wear snug-fitting, pearl-colored trousers, he had his own sense of refinement. Anthon surely never anticipated the public turbulence that would arise in the wake of a seemingly private conversation. Eremitic as he may have been, Anthon was also proud of his accomplishments, which brought him increasingly into the public eye. He became the object of both artists and photographers. Multiple images of Anthon have survived. A photo housed in the Library of Congress identified as a portrait of “Dr. Charles Anthon” has been popularized in several online and print venues, including the Joseph Smith Papers Project website and a recent publication on the production of the BoMor. The photo was taken by famed Civil War photographer Mathew B. Brady, who captured the academic, pious persona of his subject (click the images with captions for hi-res pics). Brady’s is an exquisite portrait. If only Charles Anthon had posed for the photo—but he didn’t. The person in Brady’s picture is someone other than Charles Anthon. If not Charles Anthon, what did Charles look like? Here is a short gallery of Charles Anthon images. Interestingly, images 2–4 are based on a photo (image 5) of a relatively young Charles Anthon taken by Brady. In image 4, the artist retains the body form and clothing in the photo, only aging Anthon’s face. An image of an older Anthon is also extant. Whoever the person in the Library of Congress photo may be, he clearly isn’t Charles. If not Charles Anthon, who? 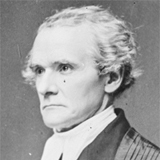 Fortuitously, Brady took at least one other picture (a daguerreotype) of the person in question—Charles Anthon’s brother, Rev. Dr. Henry Anthon. Artist renderings of Henry’s likeness were also painted and sketched. 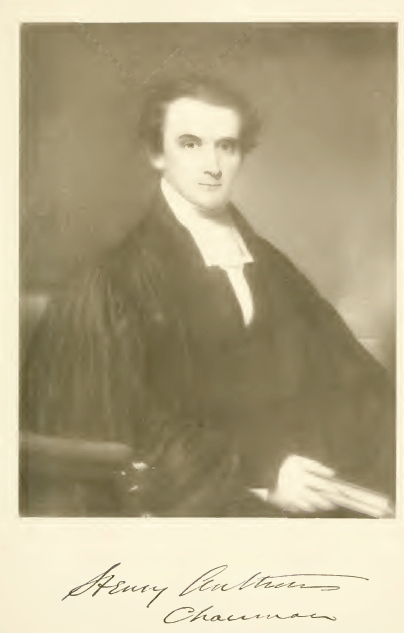 After graduating from Columbia College in 1813, H. Anthon pursued theological studies as he rose in ecclesiastical prominence. In 1837, he was chosen Rector of St. Mark’s Church in-the-Bowery where he served an Episcopalian parish in New York until his death in 1861. Upon his passing, tributes poured in to honor Henry. 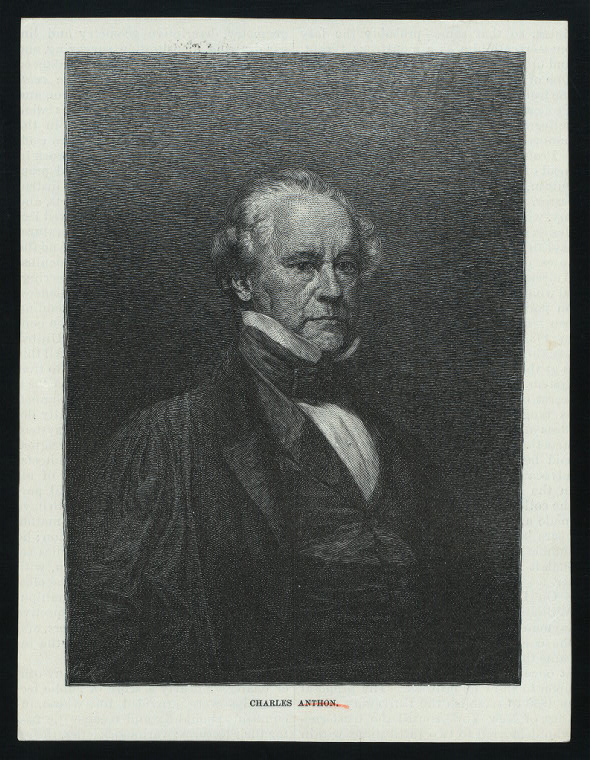 A collection of them published in 1862 includes an image of him that shows beyond question that he is the person in the Library of Congress photo. When Charles, who didn’t profess a religious affiliation, passed away in 1867, his body was interred in a burial vault at the church where his brother Henry had served with distinction for decades. I’m indebted to the better half of this Scooby-Duo, Erin B. Metcalfe, for locating several of the images used in this post. Stories of Harris’s excursion east circulated early. In August 1829, for instance, a local newspaper reported his meeting with Samuel L. Mitchill (and others), noting that Joseph Smith alone could translate the esoteric script. “Golden Bible,” Palmyra Freeman 1, no. 38 (August 11, 1829). This article was reprinted in a number of newspapers, including the Niagara Courier 2, no. 18 (August 27, 1829); Rochester Daily Advertiser and Telegraph 3, no. 878 (August 31, 1829); The Gem 1, no. 9 (September 5, 1829); Brattleboro Messenger 8, no. 35 (September 25, 1829); Salem Gazette 7, no. 79 (October 2, 1829); New-York Telescope 6, no. 38 (February 20, 1830). JSR Isaiah 29:11–26. JSR = Joseph Smith Revision of the Bible; a.k.a. JST (= Joseph Smith Translation of the Bible), New Translation, and Inspired Version. Joseph Smith, 1832 History, p. 5, bold text is Smith’s handwriting, the transcription is mine; the erased partially drawn character (represented by “∂”) before the initial “s” in “spectticke” could be the ascender stem of a t, or it may be an aborted opening ascender stroke of a p, possibly the beginning of a dittographic “prepared” (cf. the dittograph “I said I said” two lines earlier). Harris’s vision of “the Lord” directing his involvement in the “marvilous work” stands in stark contrast to his frequent portrayal as a fickle believer, one who eventually sought an affirmatory view of the gold plates. 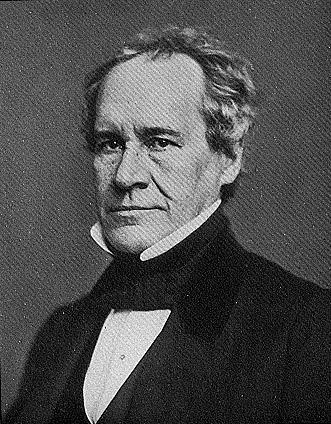 Smith’s histories and others’ reports don’t resolve why Harris would want such visual confirmation when according to the 1832 history he had already seen God who personally green-lit Smith’s project. For recent scholarship on the “Caractors” document, see Erin B. Metcalfe and Brent Lee Metcalfe, “Who Wrote the Book of Mormon ‘Caractors’?” multimedia presentation delivered at the Annual Meeting of the John Whitmer Historical Association, Council Bluffs, IA, September 26, 2013 (publication forthcoming). On Anthon’s eccentricities and privacy, see Erin B. Jennings, “Charles Anthon—The Man Behind the Letters,” John Whitmer Historical Association Journal 32, no. 2 (Fall/Winter 2012): 171–87 (esp. 173–75). Students of Mormonism have known for decades of two letters where Anthon attempted to counter stories about his meeting with Harris. In 2007, Erin B. Jennings (now Metcalfe) presented on a third letter she had discovered. Erin B. Jennings, “A Synoptical Analysis of Three Charles Anthon Letters,” delivered at the Annual Meeting of the John Whitmer Historical Association, Kirtland, OH, September 28, 2007; see also Jennings, “Charles Anthon,” 171–72, 179–87. “Anthon, Charles,” The Joseph Smith Papers, screen capture created April 24, 2015. See also here and here. Update, May 4, 2015: The entry “Anthon, Charles” on the Joseph Smith Papers Project website now displays a correct image of Charles Anthon, screen capture created May 4, 2015. Update, May 5, 2015: The folks at the Joseph Smith Papers Project graciously acknowledged my research on their Facebook page. Independent researcher Brent Metcalfe has discovered that a photograph cataloged by the Library of Congress as Charles Anthon and published by the Joseph Smith Papers was misidentified. The photograph was actually of Charles Anthon’s brother Henry, a prominent theologian and minister. We are always happy to incorporate exciting discoveries into our work and have already replaced the image previously used on our website [with a ‘new photograph of Charles Anthon’]. Michael Hubbard MacKay and Gerrit J. Dirkmaat, From Darkness into Light: Joseph Smith’s Translation and Publication of the Book of Mormon (Salt Lake City, UT: BYU Religious Studies Center and Deseret Book, 2015), 43. MacKay and Dirkmaat’s book is an important contribution to Mormon studies and deserves a wide readership. Image 1: “Dr. Charles Anthon” (see updates for May 6, 2015 and May 26, 2015 below), LC-BH82- 5385 A <p&p> [P&P], Library of Congress, Prints and Photographs Division, Washington, DC; see also LC-BH82- 5385 B <p&p> [P&P], LC-BH82- 5385 C <p&p> [P&P]. Thank you for letting us know about this error in our catalog records. The misidentified photos came to us with Charles’ name on them. Unfortunately we don’t have time to check each photo’s caption information. I’ve forwarded the information from your essay to our catalogers to correct. It usually takes a few weeks for catalog updates to appear online. I’ve also asked them to change the three photos identified as “Chas. Anthon” to Charles Anthon to make them easier to find for researchers. Please let us know if you have any other corrections. Image 2: “American Celebrities : 1. Fitzgreene Halleck, 2. William Cullen Bryant, 3. Charles Anthon, 4. Bayard Taylor, 5. George Bancroft, 6. Nathaniel Parker Willis,” New York Public Library, Digital Collections, New York, NY. Image 3: “The late Charles Anthon, LL.D., of Columbia College,” New York Public Library, Digital Collections, New York, NY. Image 4: “Charles Anthon,” New York Public Library, Digital Collections, New York, NY. Image 5: “Prof. Chas. 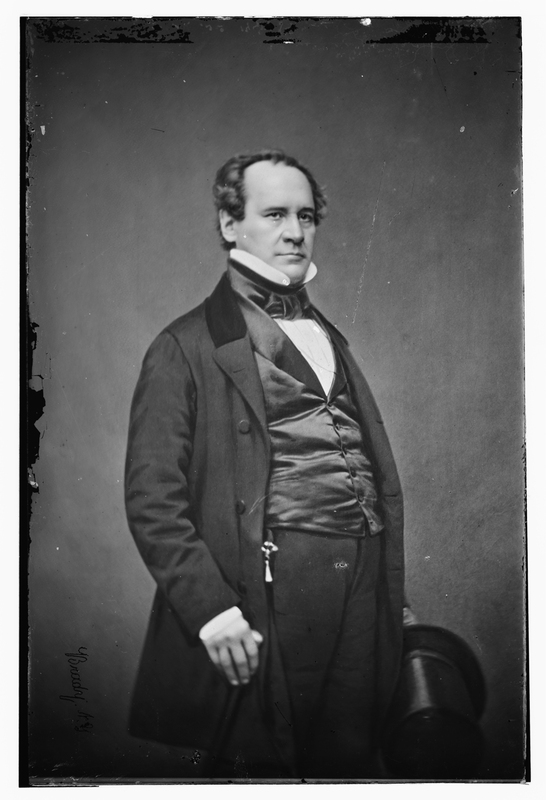 Anthon,” LC-BH82- 5216 A <p&p> [P&P], Library of Congress, Prints and Photographs Division, Washington, DC. 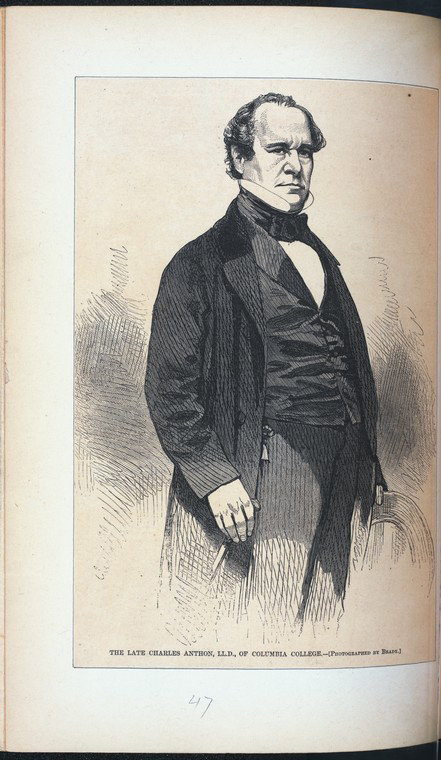 Image 6: “Charles Anthon (1797–1867),” downloaded from Columbia.edu December 3, 2012. 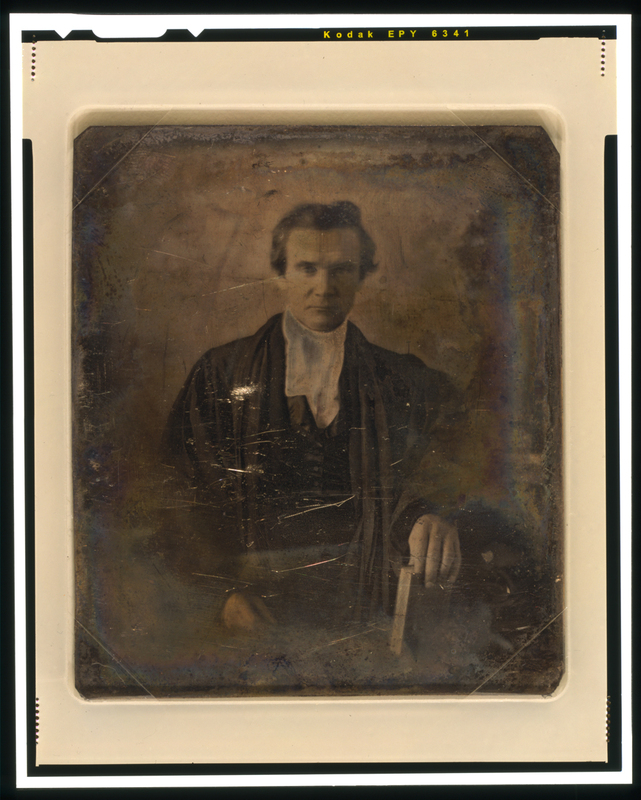 Update, July 14, 2015: A hi-res scan of the photo from which image 6 derived is now available online courtesy of the LDS Church History Library, Salt Lake City, UT (“Portrait of Charles H. Anthon,” PH 1700 2877). Harvard College Library has two sepia-toned images of the same photo (image 1) residing in the Library of Congress—one is identified as Charles Anthon, the other Henry Anthon. Image 7: “Rev. 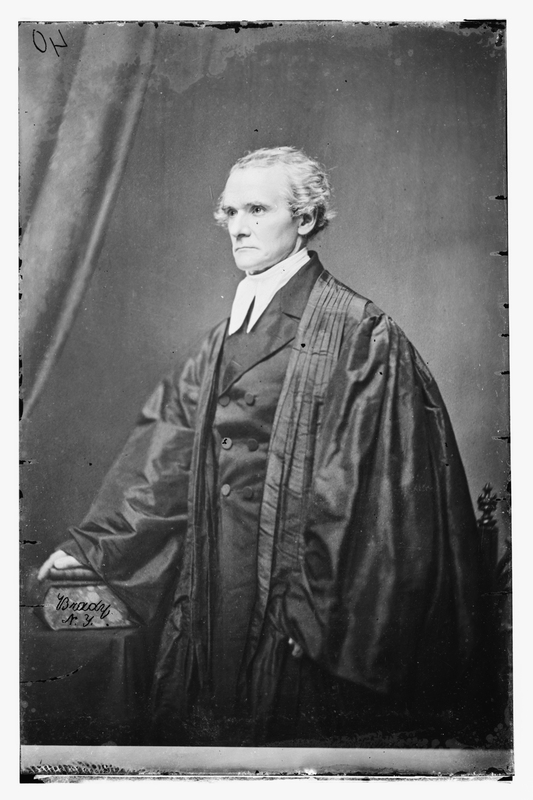 Henry Anthon, half-length portrait, facing front, wearing robe, holding book,” DAG no. 349 (LC-USZC4-6764), Library of Congress, Prints and Photographs Division, Washington, DC; see also LC-USZ62-110117 (b&w image). Image 8: Henry Anthon, downloaded from Ancestry.com April 24, 2015. Image 9: “Rev. 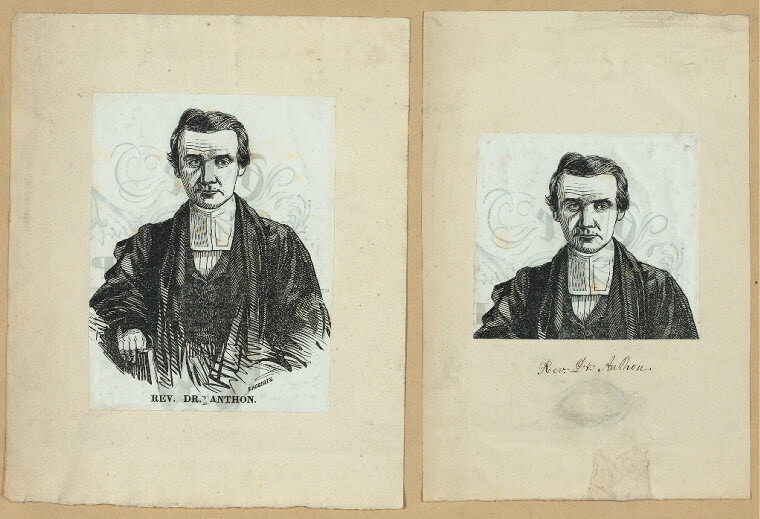 Dr. Anthon [a sheet with two portraits],” New York Public Library, Digital Collections, New York, NY. Image 10: Manton Eastburn, Tributes to the Memory of the Rev. 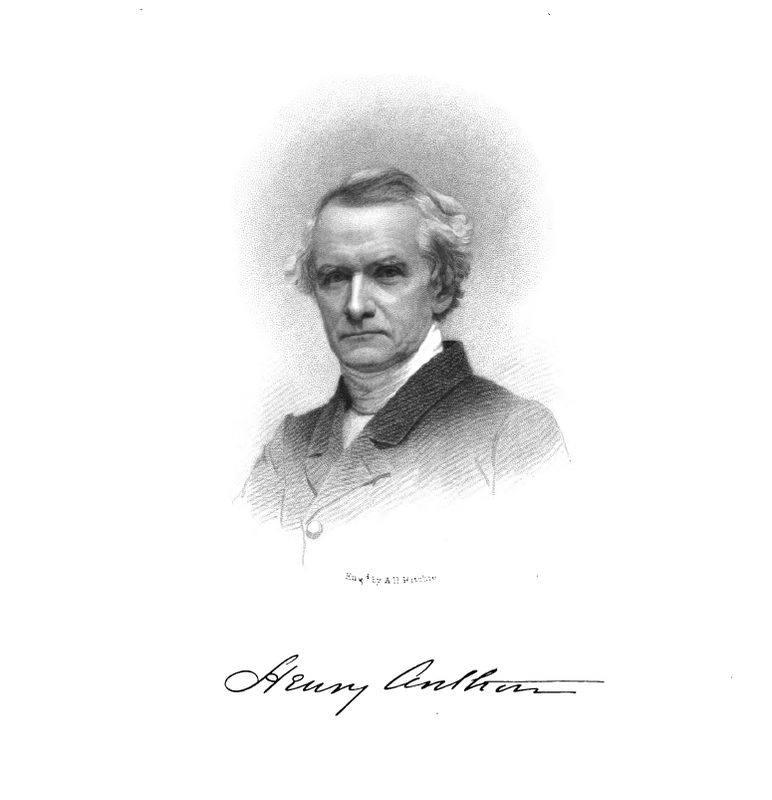 Henry Anthon, D.D. 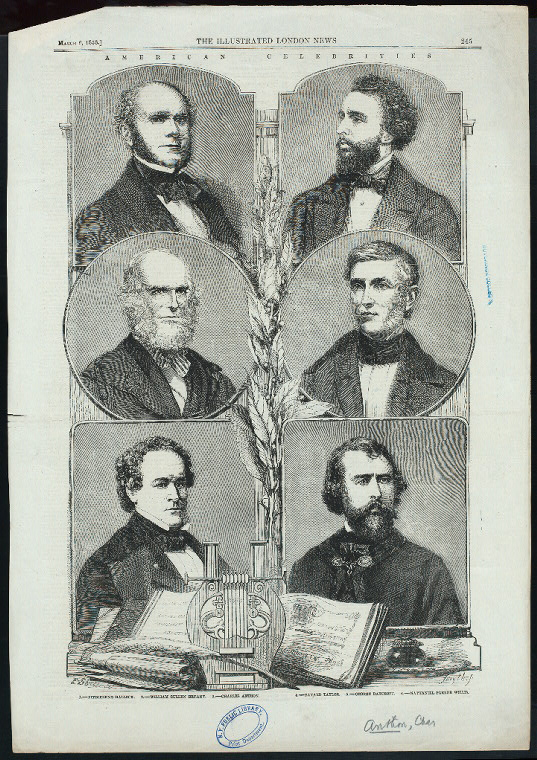 (New York, NY: Protestant Episcopal Society for the Promotion of Evangelical Knowledge, 1862), frontispiece.